If you want to upgrade your kitchen with a new distinctive and rich look, the new Black Stainless Steel appliances that are offered by Frigidaire and a few other appliance manufacturers might fit in well with your plans. They can help create a look that will WOW your family and friends. With all the new colors that have come and gone in the appliance industry, black stainless steel has the strongest commitment from the manufacturers and will probably give traditional stainless steel a run for its money in the future. It is also offered by KitchenAid, LG, Samsung, GE, Whirlpool and Bosch. The colors are slightly different from one brand to the next, as is the manufacturing process. When purchasing Black Stainless Steel appliances, it will be important to purchase your entire suite from the same manufacturer so that the colors and the handles will match. They are all sharp looking and are fingerprint resistant. The question of whether to choose black stainless when you upgrade your kitchen is up to you. In this article we’ll take a close look at Frigidaire's black stainless steel appliance models to help you decide if they might be right for you. 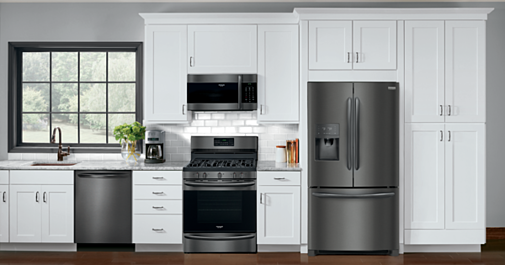 Frigidaire offers a full line of state of the art products in all categories. 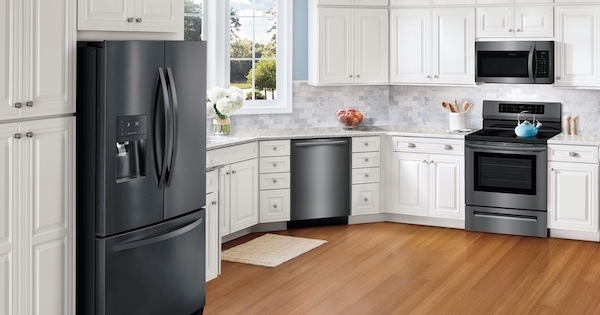 Frigidaire offers black stainless steel in their everyday Frigidaire and higher end Frigidaire Gallery lines only. It is not currently offered in their Frigidaire Professional line. Frigidaire has complete suite of kitchen appliances from French door refrigerators to wall ovens and dishwashers in this new exciting color as of 2019, including top freezer refrigerators. Frigidaire's black stainless steel is a premium finish that is resistant to fingerprints and smudges and it gives a warmer and softer look to the appliances. Their handles also have the black stainless steel finish, matching the appliance. It's a stunning monochromatic look! Frigidaire's black stainless steel appliances create a whole new look for the kitchen that is soft, elegant and different. They are exceptionally beautiful products and a great alternative to regular stainless or black appliances. Once you see them you will probably fall in love with the look. Black stainless steel has a long way to go to catch up with the popularity of traditional stainless steel, but it is on its way as more products are being introduced in the color and more customers are seeing it on display in stores and in the homes of their friends and family members. There is no way to be sure but my opinion is that black stainless steel is here to stay. Take a look at black stainless steel appliances in person. They are really a game changing item in the appliance industry. Even if you are not ready to buy yet, you might want to see them in person and experience the look.